England have dominated Australia's batsman on day two of the fourth Ashes Test at the MCG. CHRIS Rogers is a hard-headed realist and he has the wound above his right eye to prove it. The opener was able to bat on and top-score with 61 in Australia’s first innings of 9-164 on day two of the fourth Ashes Test at the MCG on Friday, despite ducking into a bouncer from Stuart Broad. Shaken but not beaten, Rogers showed the fight most of Australia’s top-order batsmen lacked in reply to England’s first innings of 255. And now with England set to claim a healthy first-innings lead, Rogers knows Australia’s hopes of sweeping the five-match series are under threat. “England are on top. I think we’ve had our worst day of the series,” Rogers said. Rogers, who was treated for a head wound on 16, batted for over three-and-a-half hours. Five of Australia’s top six failed to reach 20. “The helmet did its job this time,” Rogers grinned. Rogers admitted some of Australia’s top order had played careless shots, failing to temper their attacking instincts on a slow pitch in front of 78,346 fans screaming for attacking cricket. “It’s hard work. Usually it’s been quite good for batting but at the moment if the bowlers put it in the right areas it’s very hard to score,” Rogers said. Jimmy Anderson, who has failed to get his swing thing going on this tour, returned to prominence with a three-wicket haul alongside Broad who also claimed three victims. “England bowled very well and we got bogged down and probably looked for releases,” Rogers said. “They forced us into mistakes. 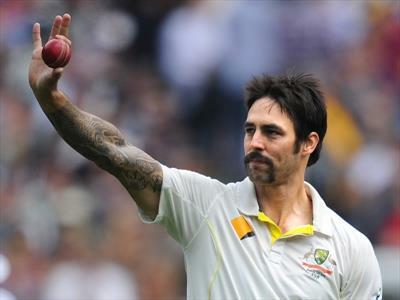 Mitchell Johnson took 3-4 from four overs in an early blitz to finish with 5-63 in England’s 255. But Australia’s batting crumbled, including George Bailey’s 19-ball duck at No.6. Bailey’s scoreless knock ended with a controversial caught-behind dismissal at 6-122. Umpire Aleem Dare gave Bailey not out. TV umpire Billy Bowden overturned the decision despite replays showing no edge on HotSpot and a possible noise on the Snicko as the ball passed the bat. Brad Haddin successfully challenged an lbw decision against him on 35 and has struck five fours and one six in his unbeaten 43. But England have their tails up. “We knew we could make it difficult for them to score because it’s quite a slow pitch,” Anderson said.